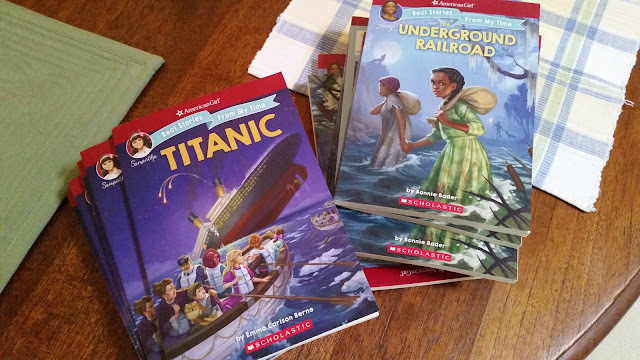 Last year I worked on two books for the Real Stories from My Time series from Scholastic and American Girl. The first two are about the Underground Railroad and the Titanic, and each features eight black-and-white interior illustrations by me. 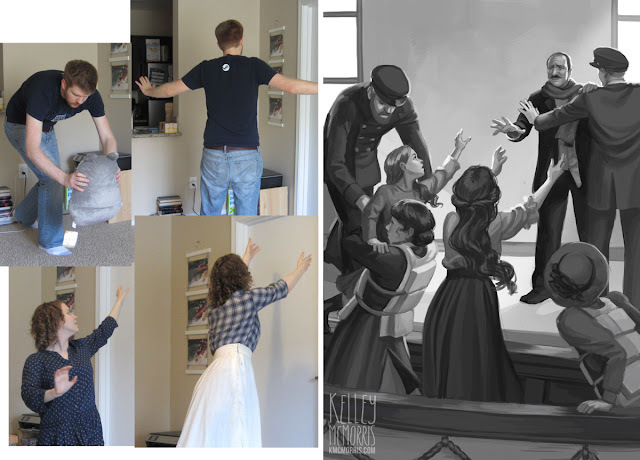 I ended up taking a lot of photo references of myself and my husband for this project. 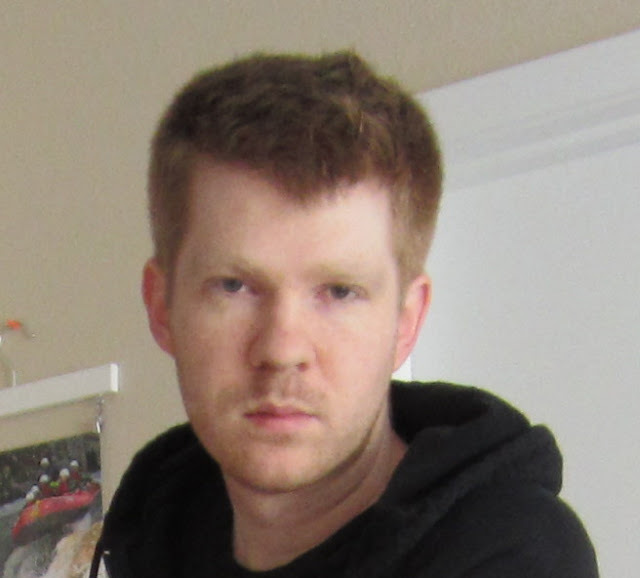 Looking back, I kind of get a kick out of them and thought you might too. I'm both impressed at my capacity for transforming my very, very basic poses into historical scenes, and also embarrassed at my incredibly lazy lighting and costuming. But not embarrassed enough to refrain from posting them online, apparently. 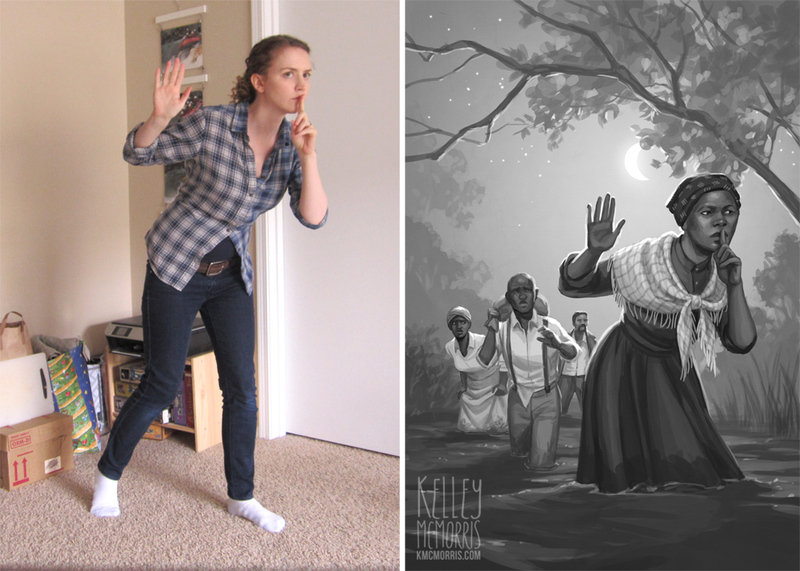 So here's some of my photos on the left and the finished illustrations that I based them off of on the right. This is Harriet Tubman, leading some escapees down a river. Looking back, I see that I bothered to use a clip to tighten my shirt and define my waist. However, I did not bother to dress up in a skirt, a scarf, or a handkerchief on my head. Lazy. Very lazy. 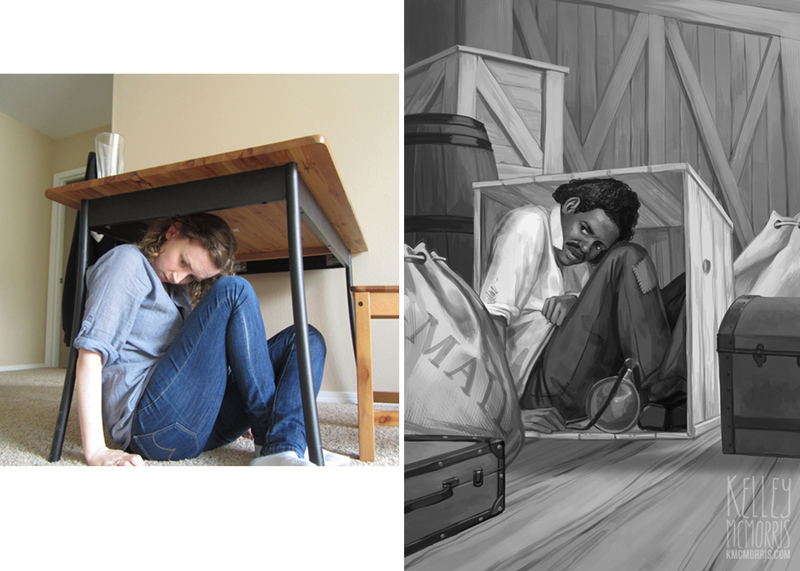 Here I am posing for Henry "Box" Brown, who shipped himself in a crate to a free state. My IKEA dining table was just about the right size to sub in for a crate. 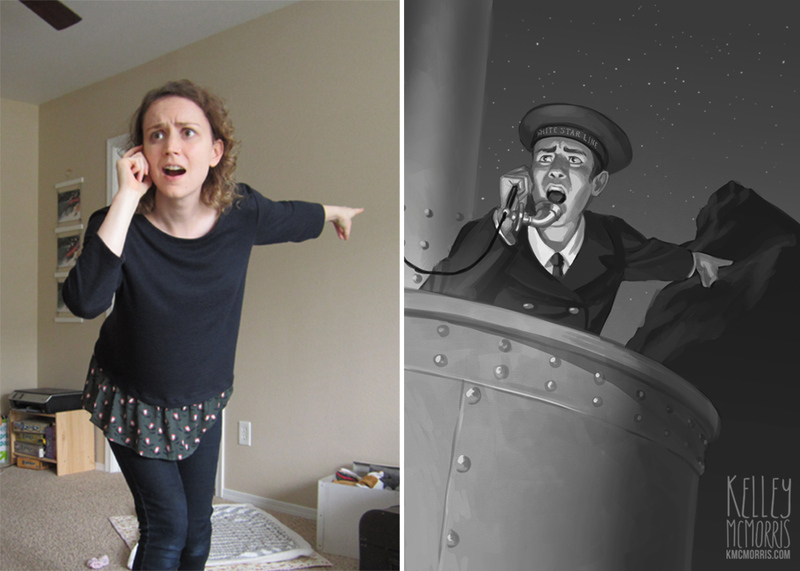 Here I am posing as the panicking lookout on the Titanic. I love how the expression turned out here! Another scene from the Titanic book. This was a fairly complicated crowd scene, with a lot of unusual poses. I enlisted my husband to help pose for the male figures. 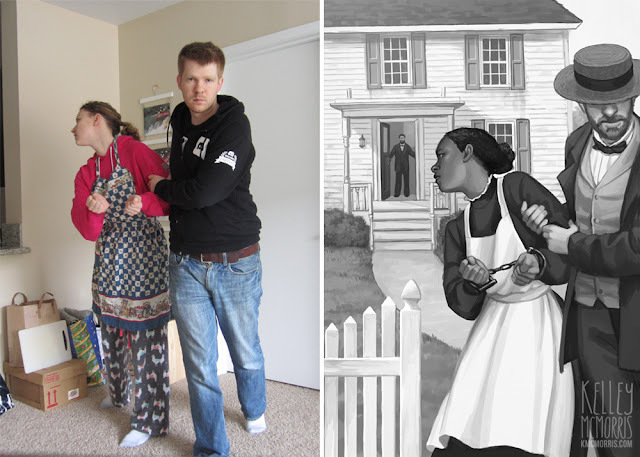 Here I am posing as Lucy Bagby, a slave who escaped to freedom and then was arrested by her former owner under the Fugitive Slave Act. It's a really sad scene, but this photo ref is so funny to me. Look at my outfit: a hoodie, pajama pants with a llama print, and an apron with a teddy bear print. That's a classic freelancer uniform, right there. Also, look at my husband's expression!!! Ice cold! But also...kind of cute??? I don't know, I'm having very confusing feelings right now. 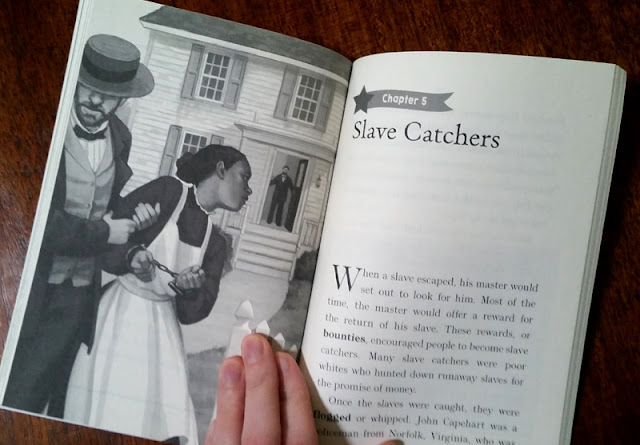 So in conclusion, children's book illustration is a very glamorous career. If you're an illustrator, let me just say that it's worth putting a little more effort into your photo references than I did here. Do as much as you can with whatever lighting and costuming you have available. The time you spend on getting better photo references will almost always save you time in the drawing phase. 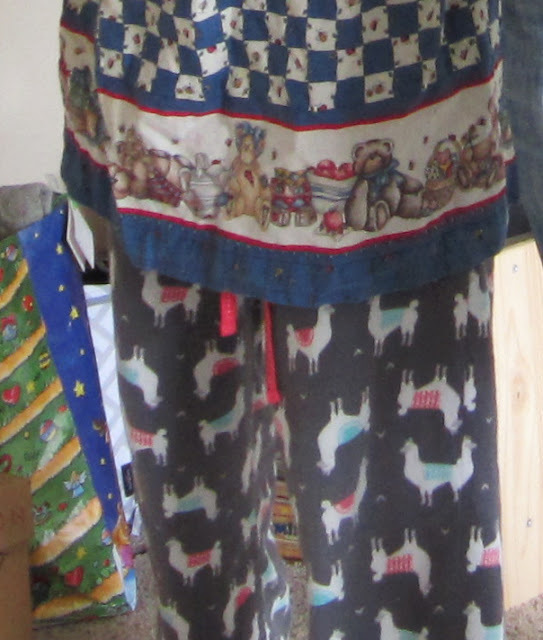 That said, if all you have time for is to throw a teddy bear apron over your hoodie and pajama pants, do what you gotta do. Women, children, and Totoro pillows first! I think these are great reference photos! Very creative, and show you don't need an exact reference to copy from, if you're a good artist. ;) Thanks for sharing. That sounds amazing!! I love how specific your scenes are!